your recepies are so sweet ! I don’t know which one to choose to start with cupcakes …You have a really beautiful blog , excuse my english , but I’m french ! Well, I’m going to read carefully your advices before starting ! More bacon cupcakes! YAYNESS! I did a maple bacon cupcake a while back and it was so amazingly tasty! 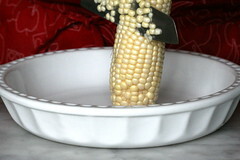 But I love the addition of sweet corn here, it’s a such a clever choice to take. 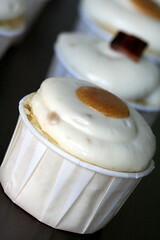 With this cupcake even more people will learn about the awesomeness of bacon in baked goods! Props C! wow those sounds amazing! surprisingly, corn desserts are typically my favorite…so i can’t wait to try these. at my work, we do an incredible corn based chocolate dessert, but corn cupcakes, so comforting! Sweet Jesus! All my favorite things together, and then in a cupcake?! You never cease to amaze, thank you for sharing this recipe. Oh my! I love the idea of using corn in a sweet cupcake. And the bacon! Oy! WOW – this hits all my favorite flavors! I’m heading out to buy all the ingredients today. Thanks so much! These look fantastic! Especially since I’ve been nibbling on the new Vosges chocolate bacon bar lately. 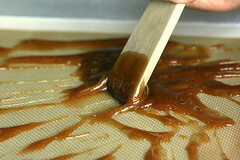 I wonder if part of the difficulty with the maple sugar candy was due to Bay Area dampness? Not that there’s not humidity in Ohio or Vermont but it is different… just a thought! I made mini Red Velvet cupcakes a while back, as I love the cake and thought the cupcakes would be adorable, and took them to a church get-together. But two of the kids who tried them thought they tasted “weird.” Most of the adults didn’t try them at all. I was so hurt! Could you please look at the recipe and see what could be so off-putting? It’s a little different than yours. Let me know and I’ll email the recipe to you. Thanks! Wow, bacon – the kind that you eat with eggs and pancakes in the morning? 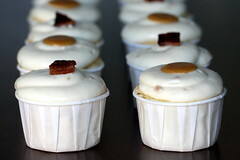 B/c I honestly never imagined bacon going on a cupcake….weird, but I think I’ll try it. You always come up with the most interesting things! Is there any other recipe for frosting that wont melt under the hot weather since I live in a tropical country. Have you heard of the maple-bacon doughnut baked by Voodoo Doughnuts in Portland? I don’t eat bacon (anymore), but I’ve heard the doughnut is delicious. I have been scratching my head for a finger food reception and this cupcake would be the perfect addition to a southern themed party. Very creative Cheryl! You are right, bacon makes the world go round! Forgive me if this is a dumb question, but what are the little bits of brown stuff I see in the frosting? Bacon bits or does the maple syrup not fully incorporate when you mix it in? The brown bits are leftover chunks of maple sugar candy from one of my many not so successful experiments. I didn’t mention it in the recipe as I don’t expect everyone to try their hand at the candy. I tried these cupcakes for a neighborhood get-together this weekend, and they were a big hit! I made half the batch with bacon and half without (in case any scaredy-cats attended), but the bacon-topped cupcakes went first! I think I’ll make these again for Thanksgiving weekend — they’ll be great with leftover turkey. Debt consolidation advice http. Debt advice http…. This actually answered my situation, thanks!